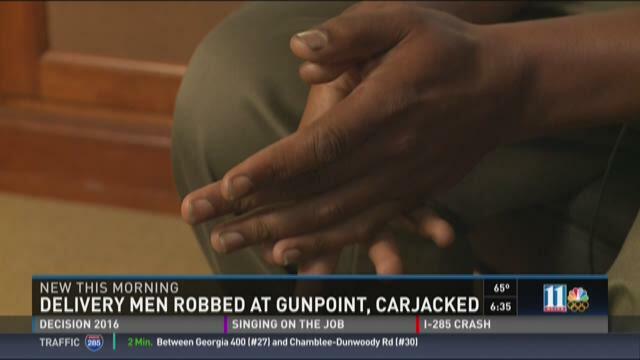 (WXIA) -- DeKalb County Police are searching for a suspect connected to a string of deliverymen being robbed at gunpoint. It has happened at least seven times with the men at times using empty apartments to target their victims. So far, four men have been charged in some of these cases that targeted people trying to do their jobs. "I was worried, scared, like this might be the end," said a former Domino's employee, describing the day he was attacked. He asked us not to reveal his name for his safety. "When I went to go deliver the pizzas, there's a guy on the stairs, he just looked like he was sleeping. I'm walking through the breezeway and another guy jumps out with what looks like a gun." It was daylight, and the man says he had arrived at the Haverly at Stone Mountain Apartments for the first time. "When they found out I didn't have that much money they started beating me and pistol whipping," he recalled. The man says he was taken to Grady Hospital with fractured bones in his face, head trauma, and impaired vision in one eye. He is not the only person to be attacked under similar circumstances. DeKalb County Police sent 11Alive eight police reports outlining other incidents in the area. The first happened in January 2014, with the rest following in January, February, April and June of 2015. According to the reports, the incidents took place at several apartments or condos in Stone Mountain with one other happening at the Haverly and four others at the nearby Marquis Chase Apartments. The reports say the suspects sometimes appeared from vacant apartments and that the deliverymen were at times called to unoccupied units as well. Police say the workers were robbed of wallets, keys and the food they were trying to deliver. The man we spoke to was one of two whose cars were stolen but later found recovered. The man we spoke with says he is still trying to put his life back together. "I don't want to go through that again, so I'm not gonna take that chance with that kind of job," he said. The victim in this case has also filed a lawsuit against the apartment complex where he was attacked claiming they should have had better safeguards in place. We contacted the community. They have not responded to us so far.